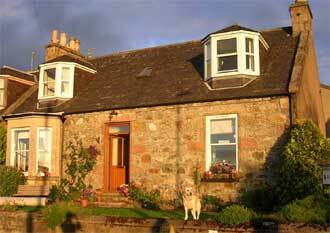 This small but friendly bed & Breakfast sits in a elevated position above one of the prettiest villages in Speyside. The views are something very special indeed. On one side you have the muscular brow of Ben Rinnes rising like a giant amongst the Consal hills, on the other the forest-shrouded slopes of Ben Aigan and below you, the cool rushing waters of the River Spey. Craigellachie is a small village just a mile or so from Aberlour. A regular bus service runs from outside the hotel on Victoria Street with towns like Elgin just 25 minutes away. Naturally, Bridge View enjoys tremendous views of Craigellachie's famous landmark, the Thomas Telford Bridge which looks absolutely magical when illuminated at night. This cosy, Scottish family home is a handsome Victorian build and boasts fully central-heated guest rooms with TV and tea/coffee making facilities and wireless broadband as standard. The double room available is smart and comfortable and the decoration traditional. The Highlander Inn (just down the 100 steps, and opposite the post office) is a first class restaurant and bar and is home to one of the best stocked Whisky Bars in Scotland. Telephone the Bridge View on +44 (0) 1340 881376 for more details.